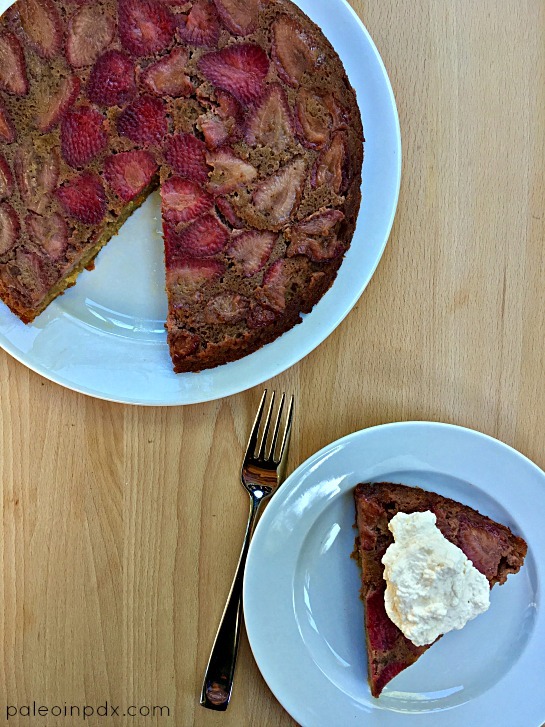 Mother’s Day is upon us and this strawberry upside-down cake is perfect for a celebratory brunch or dinner. It’s not too sweet, incredibly moist, and full of flavor. It’s got that rustic, yet pretty thing going on too. Traditional upside-down cakes have a lot of sugar, especially in the “top” glaze layer, but I scaled it way back (no refined sugar either) without sacrificing any of the flavor. The strawberries are a nice change-of-pace and pair so well with the cardamom too. This cake can be served warm, room temperature, or cold (keep leftovers in the fridge). I recommend serving it with a generous dollop of homemade coconut milk whipped cream or if tolerated, dairy-based whipped cream. Pour 2 Tbsp of melted butter into a 9-inch cake pan, coating the bottom of the pan. Sprinkle the coconut sugar on top of the butter. Then, arrange the strawberry slices on top of the coconut sugar in an even layer. With a stand or hand mixer, mix the remaining 8 Tbsp melted butter with the raw honey, vanilla, eggs, coconut milk, and lemon juice. Mix until fully blended, scraping down the sides of the bowl with a spatula as needed. In a medium sized bowl, whisk together the coconut flour, baking soda, sea salt, and cardamom. Carefully add the dry ingredients to the wet and mix again, scraping down the sides of the bowl with a spatula as needed. Spread batter evenly over the strawberry layer. Bake in the preheated oven for 30-35 minutes or until toothpick inserted in the center comes out clean. Cool in the pan for 10 minutes. Then, run a knife around the edge of the pan and place a serving dish on top. Invert the cake onto the serving dish and let sit for a few minutes before fully removing the cake pan. If desired, serve with homemade coconut milk whipped cream or if tolerated, dairy-based whipped cream. Store any leftover cake in the refrigerator. I still make your ginger pork and Hawaiian pizza recipes.